"Heathrow was created 70 years ago with the idea of creating the world hub for an emerging air travel industry. Since those far off days a great deal has changed at Heathrow, in aviation and the economy. Tents have been replaced at Heathrow with world class terminals. Aircraft are larger but also quieter and cleaner. The number of passengers passing through Heathrow each year has increased from less than one million to 75 million. International businesses have clustered around the airport bringing hundreds of thousands of jobs to the local economy. What has not changed is that despite the huge growth in passengers and flights, Heathrow is still operating off two runways. It is typical British ingenuity to squeeze so much out of so little, but we have reached the point where it is Britain that is being squeezed. 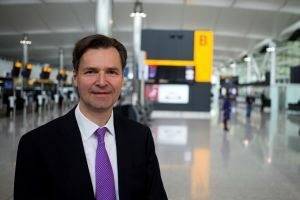 Regional airports can’t get the flights they want to Heathrow, exporters struggle for cargo capacity and Britain lacks the connections to some of the fastest growing markets of the world. The Government has now accepted the need for a new runway in the South East. They have agreed with the first recommendation of the Airports Commission that the choice is between Heathrow or Gatwick. This is progress but, as every year passes, Britain is falling further behind when we should be leading the world. We also know that only Heathrow is the answer and that the Government can say "Yes" to Heathrow. Why am I so confident? First, because of the faith that the Prime Minister has placed in the Airports Commission. If he has used it as the model for his National Infrastructure Commission, he clearly believes it was effective. If he has appointed Sir Howard Davis to chair RBS, he clearly trusts his judgement. If he has accepted the Airport Commission’s first recommendation surely he will accept the second, which said “Yes” to Heathrow. There are those, of course, who will say I am being too logical and that this is a political decision. So let us put ourselves in the Prime Minister’s shoes. What do you choose? · The new Heathrow plan which delivers your vision; economic security for hardworking families, more exports to emerging markets to tackle the deficit, supporting the Northern Powerhouse, the only option that today serves the main Northern airports and with expansion could serve Liverpool and Humberside also. · A new plan, designed to meet all your environmental targets and which has the support from the majority of local communities. · The only plan that creates hundreds of thousands of skilled jobs, that has the support of every major employer’s group, as well as the unions – as we saw in July when the leaders of the CBI and the TUC shared a platform to support expansion at Heathrow. · The only promoter with a track record of delivering huge infrastructure projects on time and on budget, and which is seen as the most financially robust option by Moody's. · The only plan with a strong policy basis, following the unanimous and unequivocal support of the Airports’ Commission. · The only plan which you know you can get through Parliament because it has the backing of the majority of MPs across all the major parties, as well as politicians in Scotland, Wales and Northern Ireland. · A resilient plan, which puts the airport at the heart of the UK’s transport system, served by five motorways and five railway lines. It is a no brainer! If LHR can accommodate another (it had five at one time), then we should go ahead asap. The architects (Richard Rogers Partnership) who designed T5A put lighting on the lofty ceiling, which is a nice experience to have daytimes. But the architects, last I heard, had not planned for the lightbulbs up there to need replacement. Several solutions were tried or at least considered, including hiring "Alpinists" to climb across the ceiling to replace the bulbs. Was a solution ever found? In fact, one of my favourite terminals until it closed was T1, where BA kept its "BMI" services for years. Hence, a PAR-AMM flight required a transfer over to the pleasantly uncrowded T1, where the lounge service was fine, and often the walk to the gate was simpler and shorter than at T5 — although BA often called premium passengers to the gate before the plane was even ready for any boarding, much less boarding of premium PAX. Too bad. The passport, security and lounge experiences were so good and smooth. Compare that with connecting through T1, where the lines can be long, and the Fast Lane is it the far end of the series of check-in spots, and is nearly always crowded. Not a great experience, especially if BAA wants to attract still more flights (and PAX).